What Day Of The Week Is November 22? 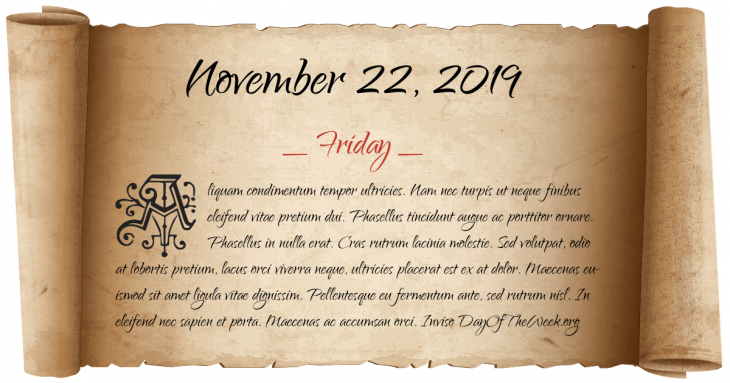 November 22, 2019 is the 326th day of the year 2019 in the Gregorian calendar. There are 39 days remaining until the end of the year. The day of the week is Friday. Discovery of the Juan Fernández Islands off Chile. In Dumbarton, Scotland, the clipper Cutty Sark is launched – one of the last clippers ever built, and the only one still surviving today. The China Clipper, the first transpacific mail and passenger service, takes off from Alameda, California for its first commercial flight. It reaches its destination, Manila, a week later. In American football, the University of Michigan upset Ohio State University, 24-12, in Bo Schembechler’s first season as Michigan’s head coach. The win set off the 10 Year War between Schembechler and Ohio State’s Woody Hayes. (See also Michigan-Ohio State rivalry). Juan Carlos is declared King of Spain following the death of Francisco Franco. In Palmdale, California, the first prototype B-2 Spirit stealth bomber is revealed. In West Beirut, a bomb explodes near the motorcade of Lebanese President Rene Moawad, killing him. British Prime Minister Margaret Thatcher withdraws from the Conservative Party leadership election, confirming the end of her premiership. Angela Merkel becomes the first female Chancellor of Germany. Who were born on November 22?